I’ve stayed here a couple of times. Good location and great value for money. 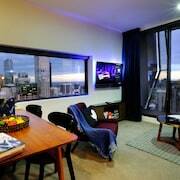 On my next rip to Melbourne I’ll definitely stay again. Great location, very overpriced! Was a great location but the hotel is looking extremely old, tired and tatty. Chipped tiles, tiny bed and just very out dated. 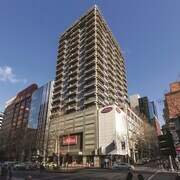 Great location We stayed at the oaks for 2 weeks its a great location for most places in the city. Home away from Home. 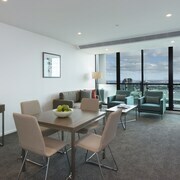 I love this complex and the executive Apartment is just amazing. 100% Reccomended! We stay here every year and will be continuing to do so! 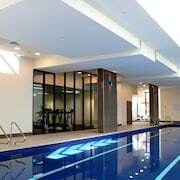 great overall Great location and good value for money. Would definitely recommend it. zentral gelegenes Hotel Großes Zimmer gebucht. Aussicht vom Balkon aus auf die Stadt. Ausgestattete Küche, so dass man auch hätte kochen können. Super auch, dass im Bad eine Waschmaschine u. ein Wäschetrockner vorhanden war. Waschmittel wurde auch zur Verfügung gestellt. 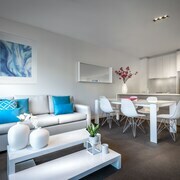 Excellent location to transport links and walking distance to main city centre. Great location A little disappointed that on a 12 night stay I was given a really dark back corner room, I guess things like duration of stay don't count? Might be nice for them to look at allocations based on length of stay? I would stay again, but would certainly urge management to look at this. Très bon séjour Nous avons passé union séjour, l'hotel n'est pas trop loins du centre et les chambres très spacieuses,piscine agréable et personnel très gentil. Melbourne might always jostle with Sydney for the title of Australia’s most popular urban playground, but there are plenty of things that set this multicultural, cosmopolitan metropolis apart from its New South Wales rival. If you mosey on down to South Yarra you'll get chichi boutiques and fine dining. If you spend your evenings with the drainpipe jeans-wearing locals of Inner East, it's all about bohemian dives and barista-led coffee houses. 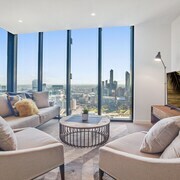 Then there are the Southbank and the city centre, each packed to bursting with soaring skyscrapers, entertainment complexes, rejuvenated docklands, and rattling tram lines that weave this way and that between the old Victorian buildings and leafy parks. It's effortless cool. 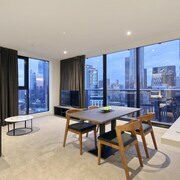 Why book Melbourne holiday rentals with ebookers? 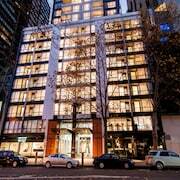 In a city where it's all about getting in with the friendly locals, Melbourne holiday apartments offer a unique opportunity to bag your own pad. 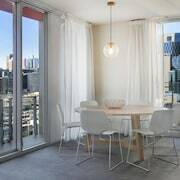 With the added benefits of large lounges and self-catering kitchen spaces, you'll be able to settle in boho areas like St Kilda and Fitzroy without worrying about looking like a tourist. And you'll likely have lots more room to drop the backpack and relax than in a traditional hotel, too, not to mention the chance to rise whenever you want – no breakfast timetables here. 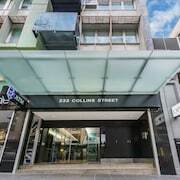 Melbourne holiday rentals also tend to come with an overload of character and charm, whether you pick one of the timber cottages in the Olinda woods or the swish penthouses above the Docklands. 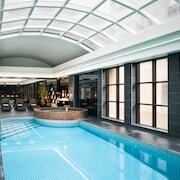 Melbourne inspires a sort of carpe diem attitude. Its woven fabric of neighbourhoods is perfect for unplanned jaunts through bohemian cafés, or launching impromptu craft beer odysseys in independent breweries. You'll want to check off the cool areas of Fitzroy and the Latin cookhouses of Carlton for sure, all before hopping across to the boardwalks of St Kilda to mingle with the international crowd under the sunset. There are also more straight-laced things to do along the Yarra River. You can shop your way through the old Docklands and the bustling Queen Victoria Market, and also trace Aussie history at the Immigration Museum. Not forgetting making time to take in the panoramas atop the Eureka Tower. 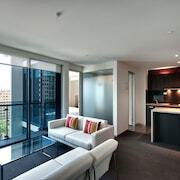 Holiday apartments in Melbourne city centre are a perfect choice if you don't want to hop on any public transport at all. From there, you'll be able to walk to most of the major sights, and delve into the nearby neighbourhood street scenes with ease. 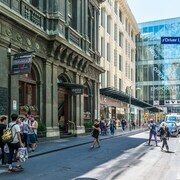 Those based elsewhere can make use of the city's wallet-friendly Free Tram Zone – a section of the transport network that costs nothing and connects many of the major attractions. 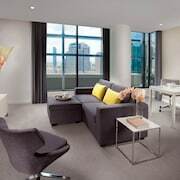 For anywhere that's not on the extensive tram map, buses are a great option, while hiring a car is a great choice if you're looking to break out to Werribee, the vineyards of the Yarra Valley, and the gorgeous Great Ocean Road.